Amyotrophic lateral sclerosis (ALS), also known as Lou Gehrig's disease, reached news feeds around the globe several years ago thanks to the viral popularity of the "ice-bucket challenge" and the film "The Theory of Everything", which depicts the life of physicist Stephen Hawking and his journey with ALS. People affected by amyotrophic lateral sclerosis (ALS) gained a new sign of hope weeks ago as researchers at the University of California, Berkeley used CRISPR-Cas9 genetic editing to disable a gene involved in the development of ALS. By disabling this gene, which is believed to cause about 20% of all hereditary forms of ALS, the researchers effectively delayed the onset of symptoms, which is marked by muscular degeneration, and extended the lifespan of the in vivo models by 25%. Though this treatment did not cure the mice models, it provides a strong indication of the potential of CRISPR-Cas9 and gene therapy as treatment for ALS. Similar to other CRISPR-focused research, this team of scientists also explore the use of virus delivery vehicles to transport the gene editing tools. For this particular case, adeno-associated virus (AAV) was used, which has relatively low immunogenicity, preventing the subject's immune response from destroying the delivery viruses. CRISPR has already provided a lot of hope and generated much optimism for a wide variety of debilitating diseases. It looks like there is no end in sight as researchers continue to explore its applications. The research team used a virus that Schaffer’s team engineered to seek out only motor neurons in the spinal cord and deliver a gene encoding the Cas9 protein into the nucleus. There, the gene was translated into the Cas9 protein, a molecular scissors that cut and disabled the mutant gene responsible for ALS. In this case, Cas9 was programmed to knock out only the mutated gene SOD1 (superoxide dismutase 1). 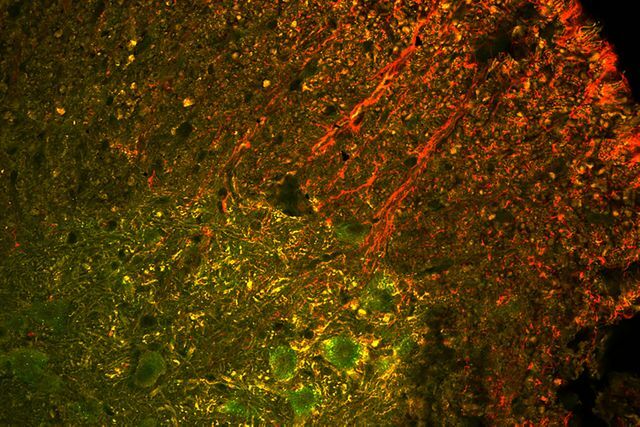 The onset or start of the disease was delayed by almost five weeks, and mice treated by the gene therapy lived about a month longer than the typical four-month lifespan of mice with ALS. Healthy mice can live a couple of years. The researchers found that, at death, the only surviving motor neuron cells in the mice were those that had been “infected” with the virus and contained Cas9 protein.